Lou began practicing yoga in 2000 and qualified to teach in 2004. Her journey began by attending a yoga class in a gym in Dublin, within a year she sat in a Himalayan ashram beginning to understand the true essence of yoga, far from its western interpretation. India led to London and an interdisiplinerary training with the Life Centre (Yoga Campus). In that time Lou trained not only with some of the UK’s leading teachers but international teachers such as Richard Freeman and Shiva Rea. 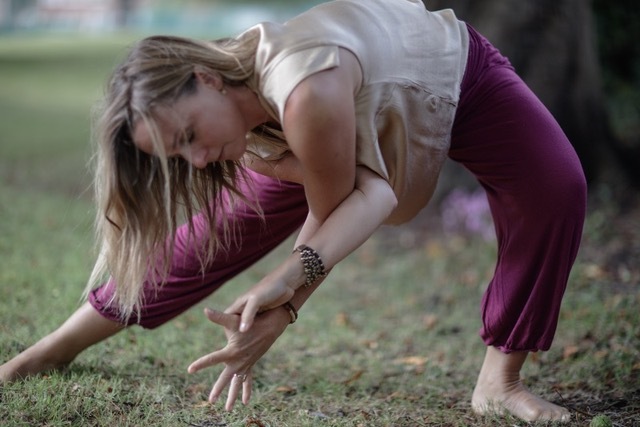 It wasn’t until she met Rod Stryker of Para Yoga she found a teacher that communicated the science of yoga, using all elements, not only asana and pranayama but the more subtle practices of mudra mantra and and corner stone of any yoga practice, meditation. Rod took these ancient yogic techniques, “downloaded” by ancient cave dwelling sages and seers and communicated their relevance to Lou as a woman living and working in a busy city of the west. More recently Lou has trained extensively with Uma Dinsmore Tuli and Alexandre Pope in Womb Yoga, focusing on specific yoga practices for women. Lou is the mother to Joshua and Alana. They have taught her through their births and early years what is is to breathe, stay present and to let go of what you thought things should look like, truly her greatest teachers! In July 2013 Lou graduated from the Institute of Integrative Nutrition qualifying as a nutritional health coach. Lou believes the body is our greatest tool in connecting us to our true essence and the food we eat has all to do with how that miraculous machine operates. In the twelve years Lou has been teaching her classes have evolved with her experiences in life. The journey yoga has taken her on, physically mentally and spiritually is always growing evolving and ultimately like life and the universe that we inhabit, expanding.